So begins the third year of yoga as a PE elective in high school, and a weekend long labor of love. Currently there are four classes scheduled for first semester with an average of 32 in each class. School starts on Wednesday, so there will be more added. I am washing and drying 36 mats, organizing by coiling up the 40 heavy duty straps, and checking for language scrawled into the foam blocks from last June for appropriateness. The boiler for the gym was replaced over the summer. I have been assured the heating system in the wrestling room (with a 2 inch thick mat) will work now. This means less ‘adventurous’ yoga because we don’t get to practice in sub 50 degree temperatures anymore. Some days we focused on our breath, which we saw, and practiced in coats. The students were reminded that there are yogis and yoginis simultaneously practicing all over the world. Let’s imagine how high the Himalayan Mountain range is, and imagine practicing at the North Pole in an igloo! Now let’s visualize Hawaii! You see, I have the distinct honor of offering yoga to high school students. I am certified to teach agriculture education and physical education in the public school setting. More recently I have been assigned more physical education courses, such as volleyball, soccer, tennis/badminton, and health fitness walking. I began to notice some disturbing trends. More students were struggling with self-esteem including but not limited to weight, family dynamics, peer pressure, sleep deprivation, and chronic injury. Some students were experiencing extraordinary stress studying for advanced placement courses and tests (we are an AVID school), and others were working so hard to fit in they forgot who they were from childhood. They lost themselves. Enough students were showing signs of depression, fatigue, isolation, hyperactivity, weight issues, poor food choices-too much or even nothing, addictive behavior, and mood fluctuations that a friend of mine suggested we begin the process of offering yoga. It had to be approved as a new course, we needed to figure out the equipment budget, an appropriate dress code, and a space to practice. And I was to answer the question, “What do we do if 200 students sign up for yoga?” I said, first, bless them. Second, let’s broach that subject when it occurs. When school started, 198 had signed up for the year. And here we are. The school board blessed the new course. We located a somewhat more quiet area in the gym with doors. It has natural lighting through old skylights which is heavenly. My friend used a grant to get equipment, and helped pay for my first two courses of training-Level One and YogaFit Kids. I had never attended a class nor practiced yoga, ever. During the spring and summer before yoga was to be implemented, I learned, had several misgivings, and then thrived, and have practiced ever since. I currently hold a 200RYT with Yoga Alliance, having received the YogaFit certificate, and have also taken Yoga Therapy, Pre/Post Natal, and Plus. I also have a home practice which includes asana and meditation, work with a master teacher twice a week, teach one class a week at a studio, and another class once a month at a fitness center. I offer ‘staff’ yoga after school to interested district employees, and another at a community center as my Karma Yoga courses! The reason I am speaking to all of this is for the many people interested in offering yoga in the high school setting beyond a community service opportunity for after school sports (although this is a perfect start). I encourage anyone who feels lead to help 14-18 year olds develop as successful members of the earth to pursue working with teens in any way possible. While it may be a challenge, it is the most rewarding application of a yoga practice imaginable. And these cherubs are so worth it! Now, back to the washer and the dryer. Two more mats done. What an inspiring and rewarding labor of love. You are changing the world in a very significant way. Your love, presence, your fire, are an incredible spark of compassion ignited in all these impressionable hearts. I am blessed to know you. 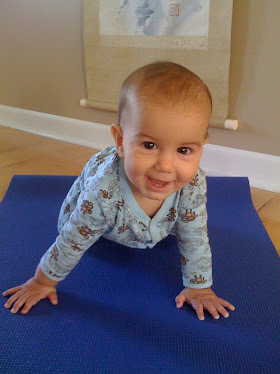 It is very nice that yoga training in schools as this make the child's health better.